It’s common to see people with an Android phone, an Android tablet and even a PC these days. In an earlier tutorial on this blog titled “How to use Whatsapp on your Computer”, I explained how you can run Android apps such as Whatsapp on a PC using Bluestacks. Do you own multiple Android devices and maybe a PC and will like to sync your Android apps across your devices such as mobile phones, tablets and even PC so you can access the same apps on your mobile phone on your tablet or even PC? 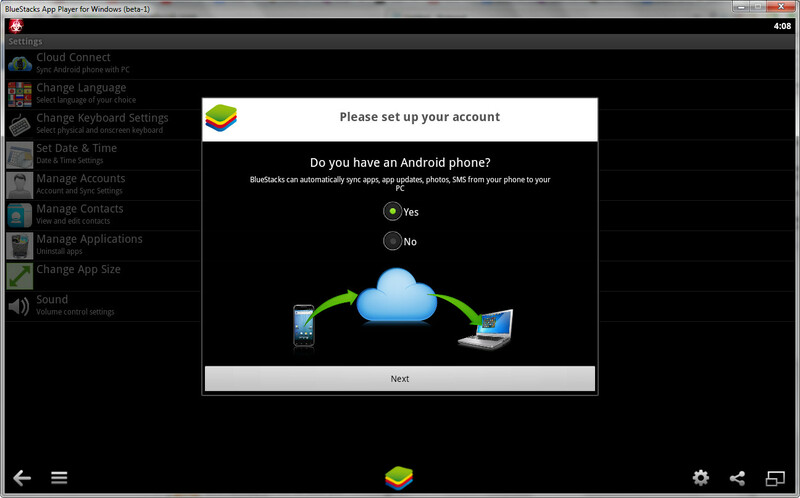 Bluestacks Cloud Connect is an Android app that makes it possible to instantly sync Android apps across devices. With Bluestacks Cloud Connect you can port apps from your mobile to your PC seamlessly and vice versa. Bluestacks Cloud Connect makes smartphones and PCs work together to provide a seamless experience for its users. I like the fact that I can use the apps on my mobile phone on my PC or even tablet and what is better is that I can use these apps without an app data loss. So I can basically continue a game I left off on my mobile on my PC without having to lose any data, or continue my Whatsapp chat or BBM chat with my friends on PC without having to lose anything. The app data is synced so I can use one app on several devices. Bluestacks Cloud Connect enables users to enjoy up to 35 apps seamlessly across preferred devices. 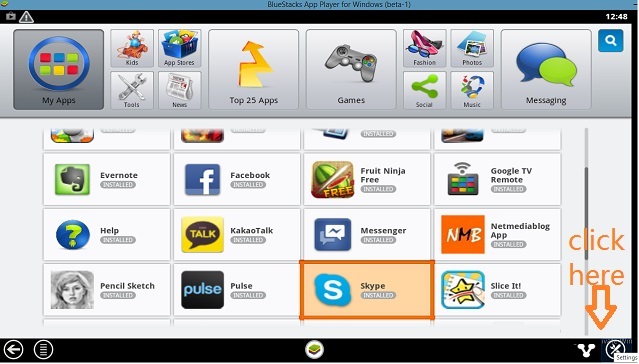 After you must have downloaded and installed the Bluestacks on your PC and the Bluestacks Cloud Connect on your Android mobile phone or tablet, then launch the Bluestacks app installed on your PC and click on the “Settings” as indicated on the image below. Then click on the “Cloud Connect” option on the Settings page to connect your Android mobile phone or tablet to your PC. Then you will be asked “Do you have an Android phone?” select “Yes” and click “Next”. 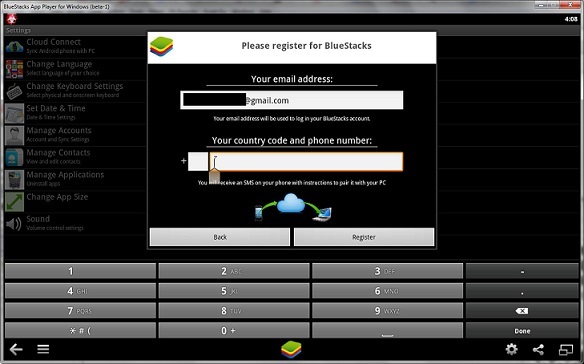 Then you will be required to enter your email address and phone number and click the “Register” button to create a Bluestacks Cloud Connect account. 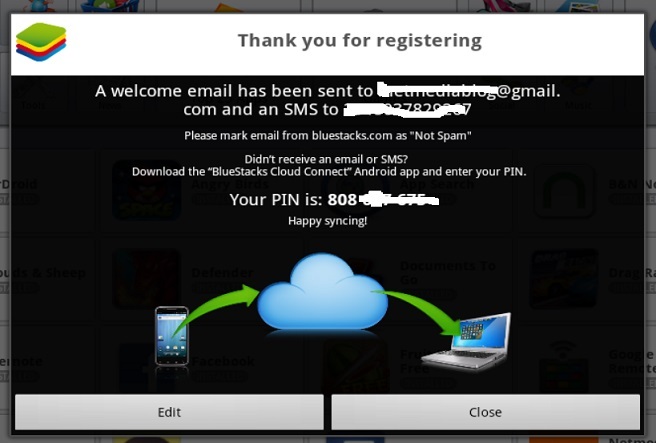 On successful registration you will be given a PIN which you will enter on the Bluestacks Cloud Connect app on your mobile phone. 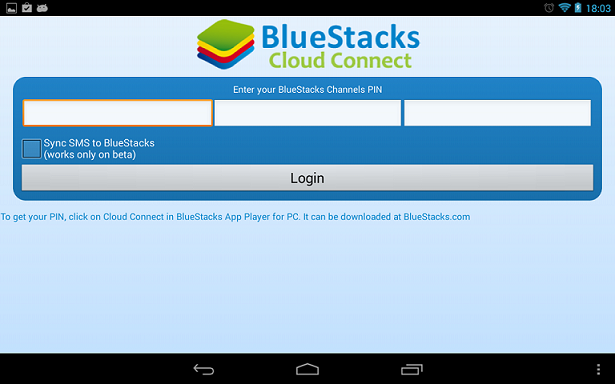 Then launch the Bluestacks Cloud Connect app on your mobile phone and enter the Pin given to you earlier. Enter the first 3 digits of the PIN on the first text box, the next 3 digits on the second text box and the last 3 digits on the last and click the “Login” button. 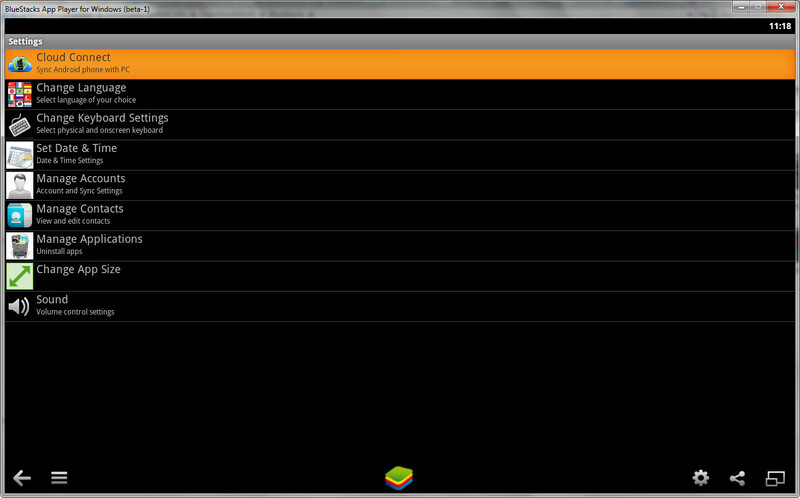 Then you can see the apps installed on your device, select the ones you want to sync and click the “Sync” button. 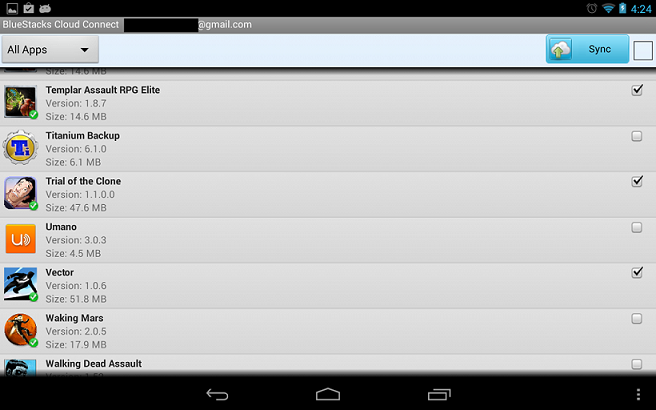 You can select as much as 35 apps at a time and sync. Now you can be able to push apps from your mobile phone to your PC and vice versa. With Bluestacks Cloud Connect you can now sync apps on your mobile and PC, make backup copies of apps and cloud integration. Thanks for this post. The Blue stacks Cloud Connect is an Android app that makes it probable to instantly sync Android smart phone apps crossways devices. With Blue stacks Cloud Connect we can port apps from our mobile to our PC flawlessly and vice versa. There is no cloud connect option in setting menu of bluestack in version 0.10.